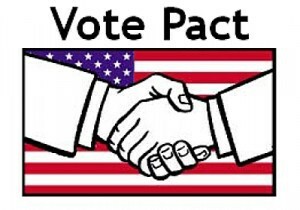 Husseini is the founder of VotePact.org, which encourages disenchanted Democrats and disenchanted Republicans to pair up and each vote for the candidates they genuinely want. He just wrote the piece “How Presidential ‘Non-Opinion’ Polls Drive Down Third Party Numbers and Facilitate Debate Exclusion,” which states: “This week, the bipartisan Commission on Presidential Debates announced what polls it will utilize in excluding candidates from its debates. “The CPD says candidates like the Libertarian Party’s Gary Johnson and the Green Party’s Jill Stein must get 15 percent in polls conducted by ‘five national public opinion polling organizations’ — ABC/Washington Post, CBS/New York Times, CNN/Opinion Research Corporation, Fox News, and NBC/Wall Street Journal. “Not only — as several have correctly argued — is the 15 percent threshold arbitrary and exclusionary, but these polls don’t actually ask voter preferences at all. “They all ask ‘If the presidential election were being held today for whom would you vote?’ or some minor variation of that. “Who you want or prefer and what you would do in the voting booth may be very different things. These ‘public opinion polls’ don’t actually measure opinion — they are a non-opinion polls. They ask a false hypothetical regarding a future action. Husseini’s past pieces include: “#BernieAndBoom,” and “A Path out of the Reversible Straitjacket of the Political Duopoly.” He is also communications director of the Institute for Public Accuracy.